The Misadventures of P.B. Winterbottom, the time-bending puzzle-platformer from devs The Odd Gentlemen, is set for release on Xbox Live Arcade next year. It’s been on the receiving end of many admiring glances here at TVGB, so we thought a chat with The Odd Gentlemen themselves was well overdue. Read on for the thoughts of Matt Korba (Creative Director, Lead Designer, President) and Paul Bellezza (CEO, Producer, Diet Coke Fetcher) on the indie scene, why they’ll never make an FPS and, inevitably, pies. That VideoGame Blog (TVGB): Winterbottom began as a student thesis. It then became a fully-fledged indie game, and it now has the support of one of the bigger publishing houses. How much has the game changed over that time? Matt Korba: Well, the core has very much remained the same. We have smoothed out and refined the mechanics from the student game to make them as clear and fun as possible and added some new time tricks. We basically took a short demo of a game and expanded it to a full game’s worth of content, complete with a narrative, leader boards, achievements, the whole nine. The art has gotten a huge update as is apparent from looking at the screenshots side by side. The tech has also dramatically changed. Unfortunately, there is no magic button to take a flash game to the Xbox. We had to build our tools and engine entirely from scratch to make Winterbottom possible. TVGB: The gameplay similarities between Braid, another indie game, are striking. 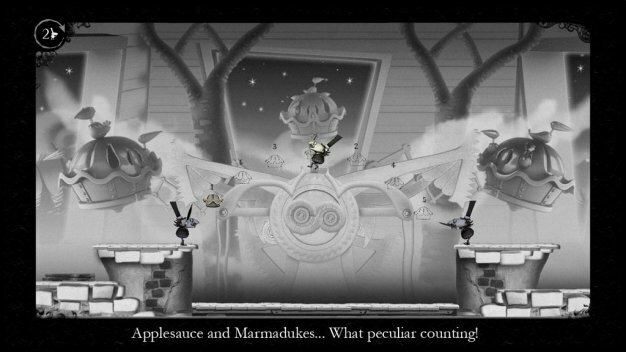 What is the main thing that makes Winterbottom different from that time warping game? Matt Korba: Strictly from a mechanic standpoint, Braid focuses on a rewind button, undoing your actions and the gameplay and puzzles that surround that core. Winterbottom focuses on a record button, cloning yourself, and the mechanics that arise from those interactions. Winterbottom has the power by teaming up with himself to play every part of the game. He can be a platform, a ladder, a pinball, cannon, even the enemy at times. 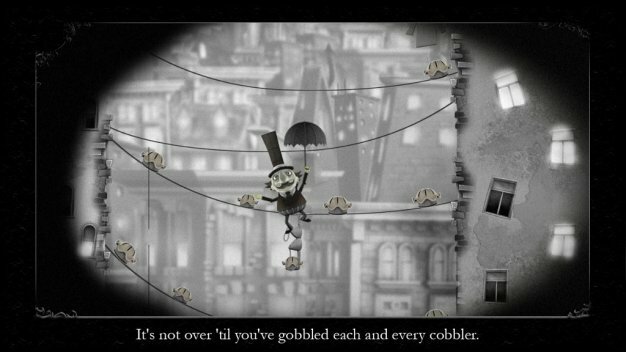 By using combinations of Winterbottom’s powers the puzzles can be solved in many open ways. Both games have “time” powers and are in 2D but the similarities pretty much stop there… Also there is pie. TVGB: In keeping with the time-traveling theme, what game do you most wished you had worked on and what game do you most wish you could work on in the future? Paul Belleza: Would have loved to work on games during the 16-bit era in particular on Sega Genesis. Very weird games came out at the time: Kid Chameleon and the first Toe Jam and Earl. They were both totally absurdist and surreal! Amazing! As a future Game: Castlevania or a game about mid-century Los Angeles Crime culture/fiction. Matt Korba: I would have loved to be around for the Sierra or LucasArts adventure game days. In the future…Well the game I wish to work on is the game we are making, but I can’t reveal details on that one yet so… I’ll say…. Yo Noid 2, The Case of the Pepperoni Poppers. I feel that the franchise ended too soon for the series to reach its full potential. As an indie game developer, do you think it has become easier to distribute quirky, original titles? Paul Bellezza: Absolutely! Self Distribution is now a reality on the PC and the downloadable services on console. Also the iPhone store and the indie channel on Xbox make getting your game out to the public easier than in the past. Matt Korba: I think the only way we can compete is to create these outside the box quirky titles. We can’t make a FPS better than Valve or Bungie. What we can do to compete, is create a silent film game about a bumbling pie stealing, time traveling villain that no one else would dream about making. TVGB: How did the decision about bringing The Misadventures of P.B. Winterbottom exclusively to Xbox Live Arcade come forth? Was it 2K’s call? Paul Bellezza: It was our call. Our programmers had the most experience on the PC platform and since Xbox’s architecture similar to the PC; it made technical sense to develop for the Xbox. We always envisioned Winterbottom as a console game. We strongly believe in the strength of using a controller for platformers, and thus XBLA was a natural fit for us. Although it is premiering on Xbox, we don’t have an exclusive contract, so ports to other systems are a possibility. TVGB: Microsoft’s XBLA approval process is notoriously tricky. What challenges have you faced? Paul Bellezza: A lot of time has to be devoted to taking care of the requirements MS has. You have to implement a lot of systems a particular way, which can be challenging. We have been aware from other developers that implementing the MS requirements can be tricky, so we focused on them since the beginning and it actual has gone smoother than one might think. Will PlayStation 3 owners ever see Winterbottom snatching up pies on PlayStation Network? What would it take for that to happen? Matt Korba: Right now we are focused on bringing the game out on XBLA. Anything is possible in the future but nothing has been decided yet. TVGB: What type of pie is Winterbottom so enamored with? Matt Korba: Winterbottom does not discriminate from any pie that comes across his way. From meat pies to custard tarts, he loves them all equally. TVGB: We love the silent film aesthetic. You studied film for your B.A. Any specific influences? Matt Korba: Chaplin’s Modern Times, Lloyd’s Safety Last, Keaton’s Sherlock Jr., Metropolis and Trip to the Moon to name a few. TVGB: Movie director John Ford (we think it was him) once said that the constraints of the studio system were actually a positive thing and that some of the worst films he ever made were the result of too much freedom. Do you think that relates to indie game development? Are the money and time constraints positive? Matt Korba: I do think it relates and can be applied to any creative medium. I think constraints in general help focus any design, especially with new designers that can spin wildly out of control and not execute in the end. For example, we knew we wouldn’t have the budget/time to do crazy cut scenes for when brainstorming for Winterbottom. Fortunately, we realized that to tell a silent film style story you really only need title cards and action, which were tools we readily had at our disposal as students. We have total freedom creatively but have to work within our real world constraints, which sometimes in the end make us come up with even crazier ideas. Still, constraints like time will always be frustrating especially when you are working with a milestone structure. There are so many more things we’d like to add or polish, but due to time we must keep moving forward. This is why it’s important to play test as early and often as possible. Paul Bellezza: As for money restraints….well it’d be nice to pay off our student loans earlier…but that seems a long way off! It also makes everyone one wear many hats, which is exciting….except when I have to wear the janitor hat or the team diet coke fetcher hat. TVGB: The indie game movement is enjoying something of a renaissance at the moment, perhaps because it provides the antithesis of the largely bloated, innovatively barren, sequel-driven culture of retail releases. What lessons can the big boys learn? Do you foresee a time when they can take more risks? Paul Bellezza: The indie game movement represents complete and utter freedom of creativity. They’re making games personal to them, and those are usually the games with the most weight. With indie accessible middleware like Game Maker, Unity, and Flash developers can jump in and create stuff rapidly. You see this huge community of young developers outputting crazy 2-D games on Newgrounds, and Tigsource and the sky is the limit. It reminds me of the older days of game development when teams were small and ideas were insane. Matt Korba: As for the big boys, as long as there are these huge bottom lines for companies to maintain, you are going to see them churning out the AAA sequels. Once a publisher creates an IP with legs… it’s going to get tapped. There’s a reason for this though, they sell… well, which keeps their share holders happy. Also, Uncharted 2 was amazing. Fortunately, there is room for the Jurassic Parks and the Little Miss Sunshines in the space of games. TVGB: In one of your staff photos, a cutout of Mr. T is prominently featured. How much fool pityin’ did he have to do during the production of the game? Paul Bellezza: Every time the sink started stacking up, the garbage pile got too high or the general man-stink of living in office built up… Mr. T wrath arose. Many fools were pitied and forced into bathroom duty. TVGB: What are The Odd Gentlemen playing right now, at this exact moment? Paul Bellezza: I’m playing Bionic Commando for Xbox because I got it on sale. It’s pretty decent although the story takes it self so seriously it’s depressing. You’re a dude with a bionic arm…it should be cheesy as hell. No one with dreads can be taken seriously as an action hero…they’re always a hippie first. I’m looking forward to playing Batman Arkham Asylum and Uncharted 2. MattKorba: I am playing Uncharted 2, about to start A Boy and his Blob, and am making my way through The Dig again.